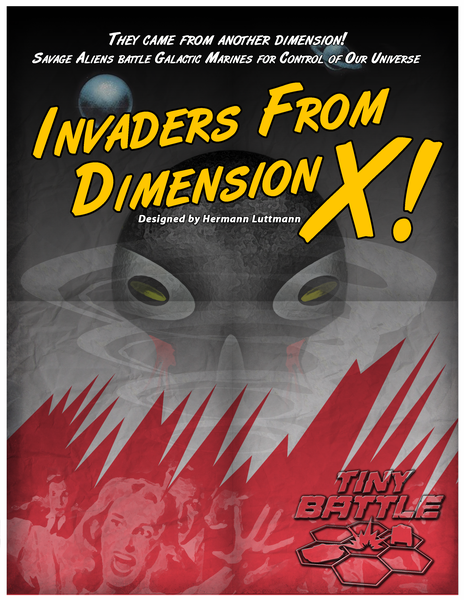 Invaders from Dimension X! is a solitaire game (with a two-player option) that begins the story of the brutal war between the invading alien Kay’otz race and the only human force capable of defeating them – the “Old Reprobates” of the 124th Galactic Marine Raider Battalion. You control the various Marine squads, each with a specialized skill, as they fight their way through an alien enemy that is totally unpredictable. The Kay’otz come from another dimension of space and do not behave in a way humans can comprehend. Only with perseverance and skillful strategy – and yes, some good fortune – will you be able to eventually discover the plans and tactics of these mysterious beings. 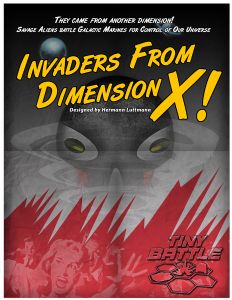 Invaders from Dimension X! is an easy game to play and is suitable for players 12 years old and up. There are two Battle scenarios and one Campaign scenario included in the game and each can be completed in about an hour or two (depending on the scenario played). This game package contains one map sheet (with two separate maps printed front and back), eighty-eight counters and one 8-page rule book. You will need to provide some six-sided dice to play the game – along with enough backbone, brains and wits to defeat this vile alien enemy.